Of the many Warhammer art books, this one focuses on the art of Clint Langley. He's Black Library's most prolific artists, responsible for creating the gritty art for the novel covers as well as the collectible card game. 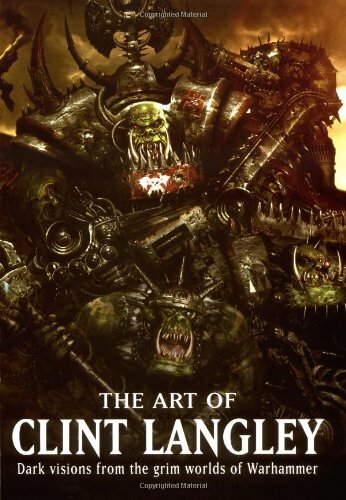 The Art of Clint Langley is a 96-page paperback. The full colour illustrations within tell a story of a battle-torn universe. Each piece is created with painstaking detail, every last button, fringe of braid, battle scarred armour and textured coat. The scenes are intense, depicting never-ending battles. The weapon and armour designs are always elaborate. It certainly looks like every warrior is wearing armour made up of hundreds of parts. Everything's pretty extravagant, nitty gritty extravagant. Some of the pieces have commentary provided by the authors. Clint Langley also wrote a bit of stuff, such as how he prepares as I've quoted below. When I receive a brief, as soon as I read it, I can imagine the image in my head. To a certain extent I'll hear the soundtrack and see the image moving. I'll often stand around and move into poses to put myself in that moment. For instance, as soon as you mention Chaos Space Marine, I'm beginning to see the sky boil and a Khorne Berserker charging over the hill. This is a great book for sci-fi, fantasy artists, as well as Warhammer fans. You can check out more work of Clint Langley at www.clintlangley.com.